Before starting my walk, I found this route online to use, although sometimes my hikes don't always follow the routes I intend. Often I ended up veering away if something catches my interest. This isn't a problem on shorter routes, where I never wander too far off course. Probably not recommended for longer or more complex routes though! 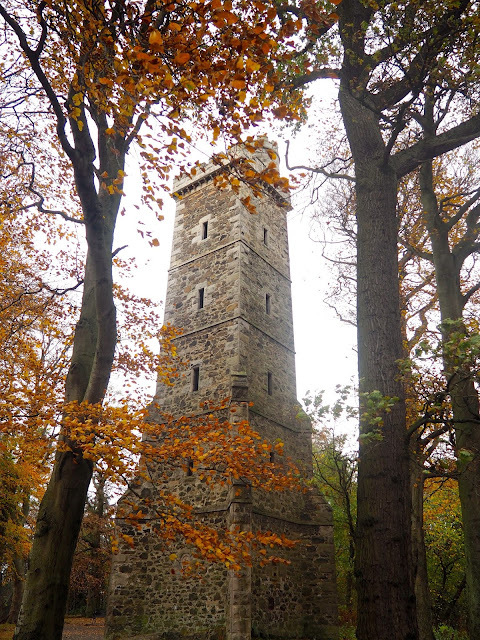 Corstorphine Hill is a fairly small area though, like a woodland park, so it's easy enough to regain your bearings. There are a couple of access points around the park, and I entered on the west side, after taking the 26 bus from the city centre. I was heading south for most of my route, along the western edge of the park, and slowly climbing uphill as I went. The route would have been circular, but I ended up doing a straight line instead - you'll see why. In terms of hiking, it's a pretty easy climb, with a gentle incline that doesn't go very high. There are paths throughout the woods, but not all are very clear, and they criss-cross each other a lot. That's partly why I abandoned the route, as it's pretty difficult to stick to a set path in these woods. I wove in and out of the tree line, so it was clear I was still heading in the right direction. Mostly I was distracted by the scenery! We're right in the middle of autumn, and Corstorphine Hill was particularly bright with autumn hues. Many trees still had all their leaves, in varying shades of green, yellow, and orange. 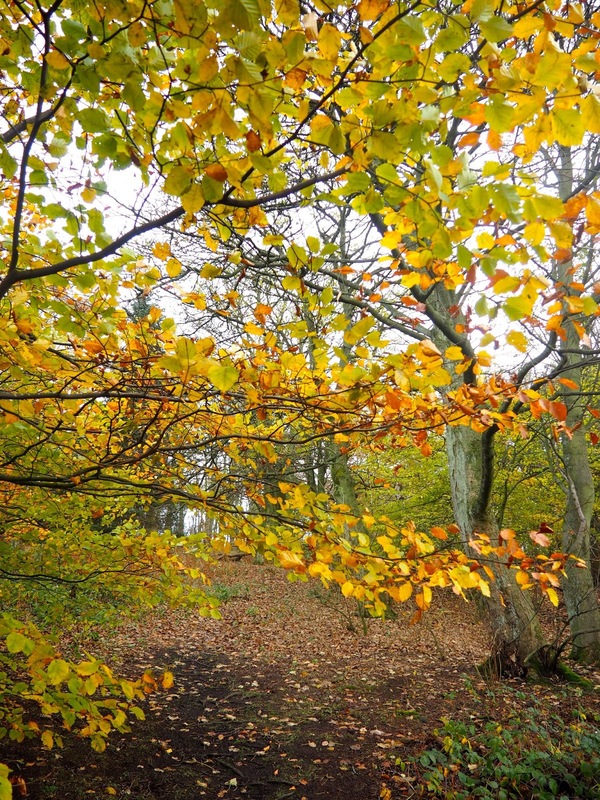 Meanwhile, the ground was coated in oranges and browns, leaves that crunched underfoot. These dry, bright days are my favourite, when the leaves are crisp and the sun catches the colours. It was much like our trip to Roslin a few weeks ago! When it's grey and rainy, you just don't get the full effect! I had my proper camera with me too (an Olympus Pen), and I'm not a pro photographer by any means, but I was having fun trying to get some good images. Eventually, I reached the peak of the hill, where there is the Corstorphine Hill Tower, also known as Clermiston or Scott Tower. 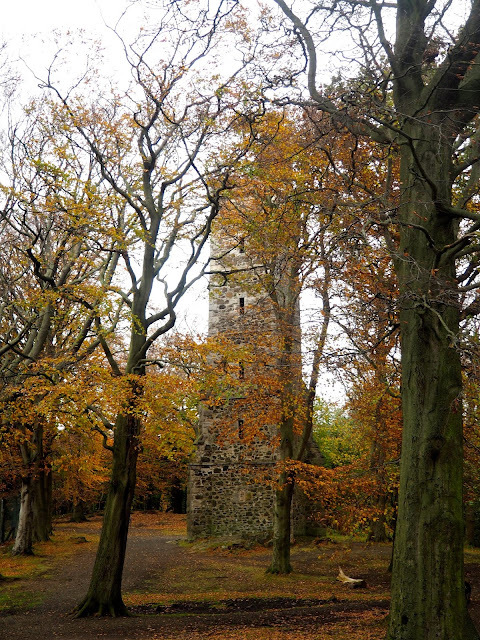 It's a simple square tower, going straight up through the trees, framed wonderfully by the autumn leaves. It was built in 1871, and dedicated to the writer, Sir Walter Scott. There's plenty other things dedicated to him in Edinburgh too, including the Scott Monument on Princes Street. Most of the time it's locked, but sometimes they open it to the public. Apparently the views from the top are superb, so I might have to head back over next time it's open! I lingered here at the top for a while, taking more photos and enjoying the scenery. The summit is still amongst the trees, so there aren't any views of the city to be had. This was where my original plan was to loop back north, around the eastern edge of the park. However, a lookout point marked on the information boards around the park had caught my eye. So instead, I continued south towards it, and the path from there would eventually take me back down to bus route on Corstorphine Road. From the summit, the path went downhill quite rapidly, into a little valley. 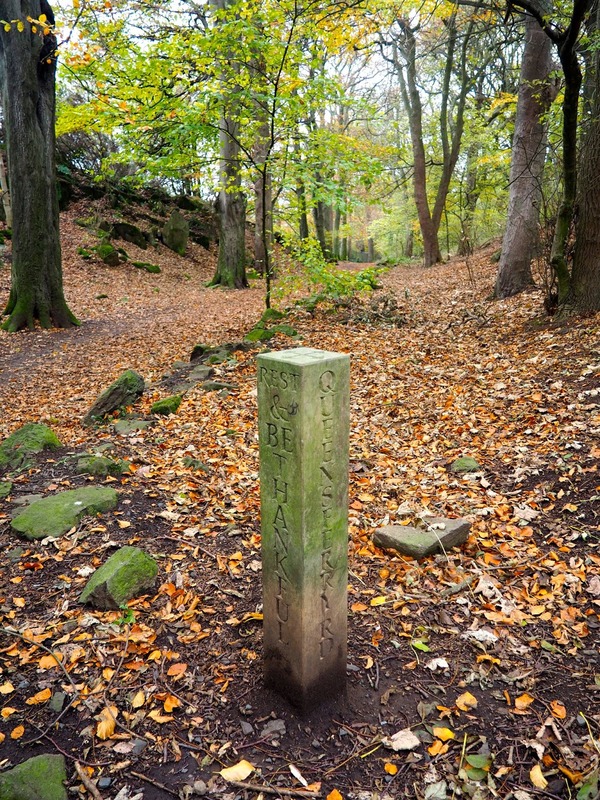 It was here that I found this signpost, a standing stone with four destinations marked on each side. I already knew which way I was going, but I love how old and rustic this looks. A far cry from most modern signs, and it blends so well with the natural habitat. Corstorphine Hill actually crosses over into the land owned by Edinburgh Zoo, so the southern edge of the park runs along the fence. I've seen mention online that you might be able to glimpse some animals through the fence, but all I saw was a zookeeper doing gardening on the trees. There was a last incline as I approached the southern edge, then I was following a clear path around. 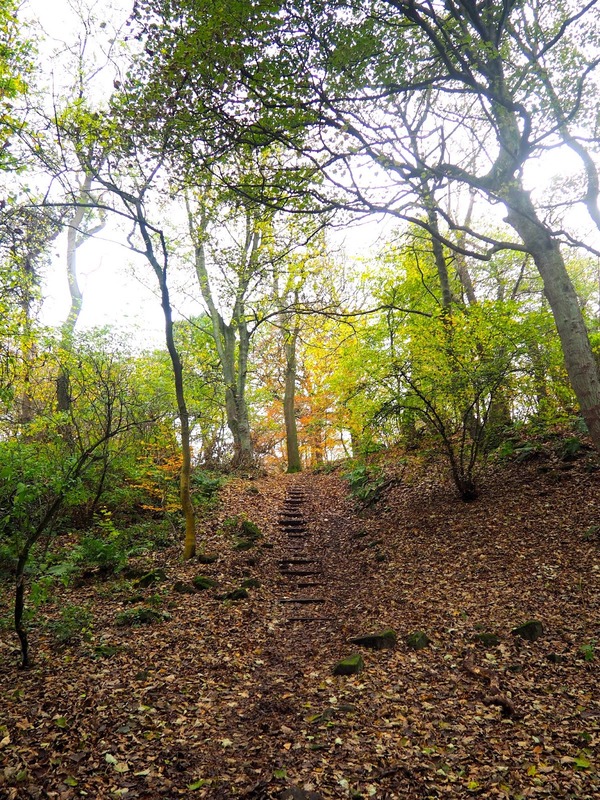 The path actually forms part of the John Muir Way, an epic hiking trail across Scotland. I've done a couple sections in the past, as it covers quite a lot of Edinburgh. Eventually, I reached the viewpoint, named 'Rest and Be Thankful'. This offers a spectacular view to the east, of Edinburgh's city centre! I could see all the major sights, including Edinburgh Castle, Arthur's Seat, Calton Hill, and Blackford Hill. I was lucky to have clear weather too, allowing me to see all the way to the Firth of Forth, and beyond to Fife. The information board here includes a quote from 'Kidnapped', by Robert Louis Stevenson, from when the characters reach the same viewpoint. I lingered here a while too, as I don't think I've seen Edinburgh from that angle before. The path then curved downhill to the south, and opened up more views over the city, including the Pentland Hills. Edinburgh's city centre has the most iconic features, so I don't always feel other views in other directions are quite as impressive. It was still pretty good though, and a nice change from the woodlands I'd been surrounded by. It was a short decline over some open grassland, then one final stretch of trees, before I reached the road again. Corstorphine Road is a major route through the city, so I didn't have to wait long to catch any one of the buses back into the city centre. 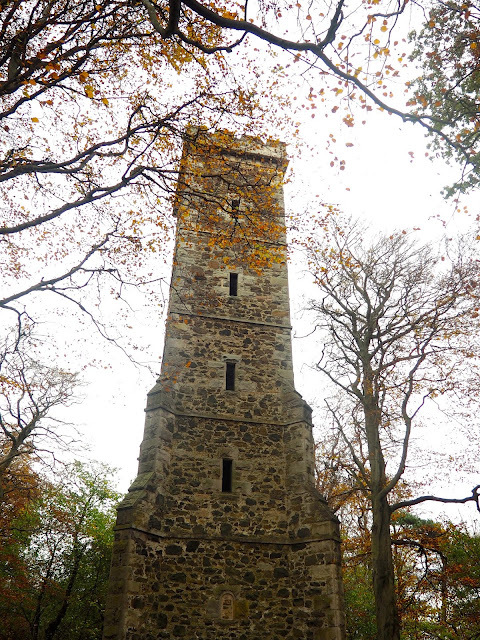 Overall, I thoroughly enjoyed exploring Corstorphine Hill. I went on a weekday, so the woods were pretty quiet, with only half a dozen or so other people around. I enjoyed being surrounded by woodland, but then the trees opening up to present the views over Edinburgh. Hikes that reward you with viewpoint like that are usually my favourites! Clermiston Tower was pretty cool to see too, and I'd definitely like to go up when it's open one day. The whole hike took me a little under two hours, with plenty of stops to take photos along the way. Definitely one I'd recommend, and part of the city that is less visited than other well known hiking routes!